We have seen how to lose the war on drugs and how entire communities have been devastated by this senseless ideology. Targeting the users, making them criminals and declaring war on them has failed spectacularly, and countries that keep wasting taxpayers’ money on their failed war on drugs, led by the United States, keep seeing more and more people die every year from drug overdose. The concept has failed and many people have died as a result. Over 64,000 people died from drug overdose just in the US in 2016 and many of them could have been saved. In 2001, the southern European country of Portugal had a severe drug problem as well and they decided to end the war on drugs. They did not end pursuing the drug traffickers, trafficking drugs has remained a crime and drug dealers are still sent to prison. What they did change was their approach to users. Instead of treating drug users and addicts as criminals in need of punishment, they have begun to treat them as patients in need of help. As long as drug users only possess amounts that add up to be up to 10 days supply, they are addressed by a social worker, who is trained to provide the needed help to avoid or overcome addiction. In Portugal, drug addiction is treated as a public health issue and not as a crime. There are public health initiatives to discourage drug use in the first place and treat addiction when needed. This experiment, that is now known as the ‘Portuguese model’ was treating the drug user exact opposite to the war on drugs, that is based on severe punishment, imprisonment and even capital punishment. For the last 16 years, Portugal has been treating their drug using residents this way, while countries like the US and Australia have been dramatically increasing their prison populations, mostly by imprisoning drug users. The results speak for themselves. The Portuguese model is not only a more humane approach, but it is a lot more effective as well. Portugal has the lowest drug mortality rate in Western Europe, going as low as 85% of what it used to be in 2001 when they opted out of the failed war on drugs. 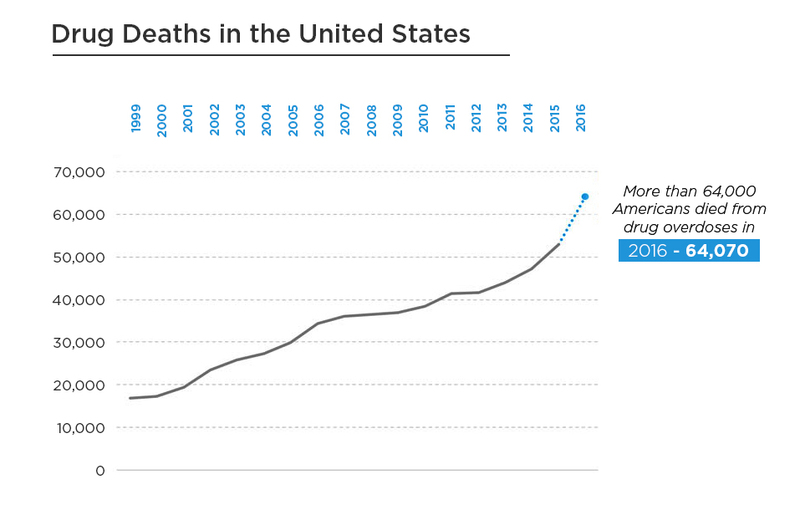 During the same time, the number of drug-related deaths has gone up over 300% in the US. Drugs are killing more people now than car crashes and become the leading cause of death under 50. The US leads the world with 185 deaths per every million people per year, with Estonia in second place with 102 deaths per million people. Portugal loses 6 people per million to drug overdose. 6 deaths vs 185 deaths make math easy. Why would any country want to embrace the war on drugs when it kills so many people? 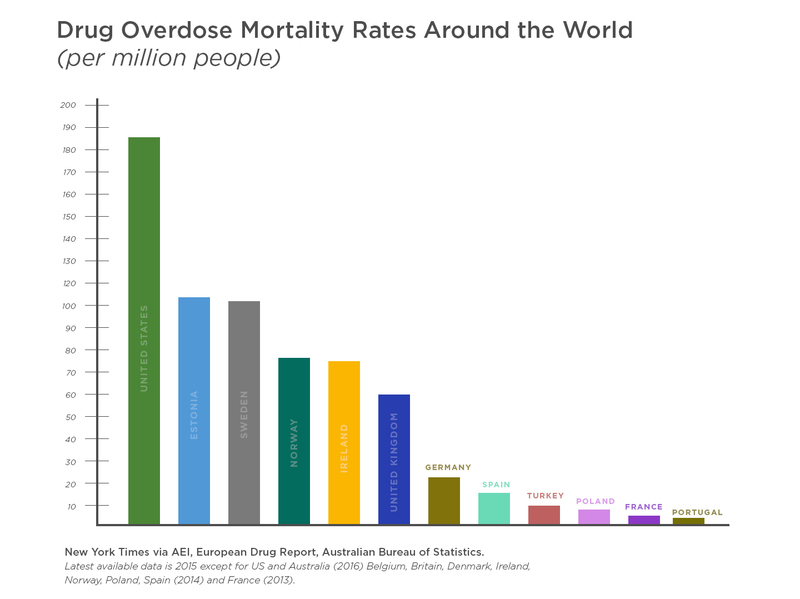 If the US could decrease their drug overdose death rate to where Portugal managed to get, it would save a life every 10 minutes. Countries that copy the war on drugs without thinking, such as Australia are failing spectacularly along the US. Last year, Australia had the highest rate of drug overdose deaths since the 90’s, with 75 deaths per every million people. Obviously, every country would be happy with the results Portugal has produced and there are movements in the US as well as in Australia to end the spectacularly failed war on drugs. Drugs do not disappear when you end the war on drugs, however, a whole lot less people died when they are treated as patients, not criminals. Leading addiction experts from around the world have been vocal about the fundamental flaws of the war on drugs. People use drugs to relieve pain and targeting users, targeting addicts as criminals does a lot of damage to society, not to mention the individuals affected. of Portugal at the time and he is credited with both, taking the incredible political risk that such a dramatic change to drug policy meant and also with the incredible results and success that it resulted in. Mr Guterres is now the Secretary-General of the UN and hopefully, this will enable him to bring the war on drugs to an end at the UN and to promote a humane and compassionate drug policy this world needs so desperately. It is not only a social and health issue but also an economic one. The failed war on drugs cost a lot of money to run and not to mention the cost of locking people up. The US has spent a trillion dollars on its failed war on drugs over the decades and every household had to chip in with about $10,000 to be able to do that. Portugal’s Health Ministry runs its highly successful drug policy with a budget that means about $10 to every taxpayer a year. Treating drug abuse as a health issue happens to cost a lot less money. Clogging up the justice system with drug possession and use cases costs huge amounts of money and running prisons are expensive too. In the US, it costs $30,660 per year for every inmate while in Australia, for example, the cost is $109,500 per year per inmate. 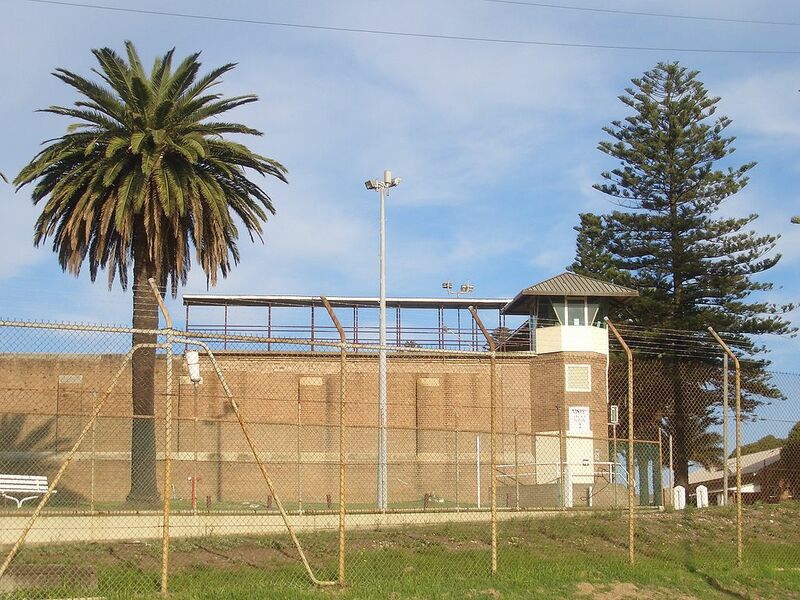 With the prison population at its highest since Federation, Australia is pumping a lot of taxpayers’ money to imprison drug users and addicts. It is time that the world wakes up to how to win the war on drugs and all we have to do is to look to Portugal and follow their steps out of this mess.